You will earn 15,350 Reward Points. Earn 1 reward point for every 1 dollar spent. 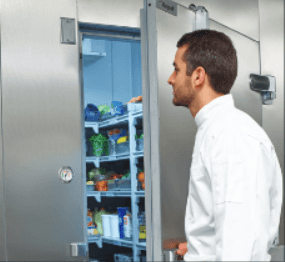 The Kolpak KF8-1216-C8-F8 Kold-Front Walk-In Combo includes an 8-foot freezer section that cools at a low temperature of -10°F, and an 8-foot cooler section that maintains a medium temperature of 35°F. This spacious, easy-to-clean unit features a 26 ga. embossed galvalume interior and exterior, a .100 smooth aluminum floor, and a standard 34" x 78" door. With optimal durability and versatility, it can be used indoor or outdoor. It is 102 inches tall, 139 inches wide, and 185 inches deep.